The Goodman School of Mines announced via its executive director, Dr. Bruce Jago, that it will be making a significant investment in a new permafrost laboratory and permafrost science training at Laurentian University over a period of three years. This training aims to give students the opportunity to gain practical field-based and laboratory-based experience in permafrost science, and to graduate with cutting-edge, concrete, and marketable field and laboratory experience in permafrost assessment and monitoring. 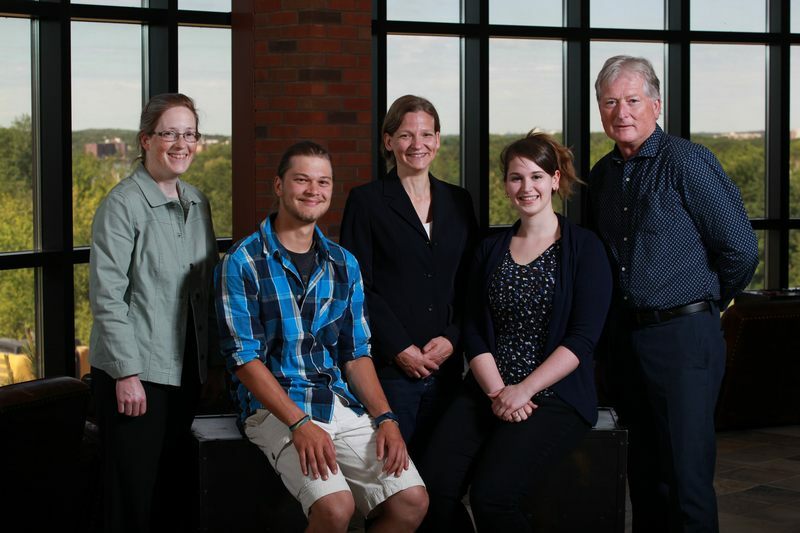 Left to right: Dr. Elizabeth Dawes (Dean, Faculty of Arts), Nathan Romahn (student), Dr. Pascale Roy-Léveillée (Assistant Professor of geography) Krystal Siebert (student), and Dr. Bruce Jago (Executive director, Goodman School of Mines). Laurentian University students are already directly benefiting from this support. Emma Ciric will be traveling to central Yukon this summer to investigate controls on rates of permafrost degradation in the Blackstone Uplands as part of her undergraduate thesis in Geography. Nathan Roman will be joining her for his ADVL internship, to gain practical experience working as a technician and logistics coordinator for research and monitoring activities in remote areas. Krystal Siebert is working on a GIS-based project related to permafrost degradation and organic carbon. At least two other students are scheduled to begin graduate and undergraduate theses in 2017, and we are hoping several other students will be joining our team in the coming year. Laurentian University, with its long-standing relationship with the mining industry and its proximity to the Hudson Bay Lowlands, is in a strategic position to respond to the increasing demand for skilled permafrost technicians, consultants, and scientists resulting from increased infrastructure development in the Canadian Arctic and Subarctic. In these regions, the ice content and temperature of underlying permafrost can be major concerns for infrastructure development, waste disposal, water contamination risk assessment, environmental monitoring, and site recovery. The new permafrost laboratory, a new 4th year permafrost course (GEOG4256), directed studies on permafrost issues, and related undergraduate thesis projects will be housed in the School of Northern and Community Studies, within the Faculty of Arts. Graduate thesis projects will take place within the MSc Biology and the PhD Boreal Ecology programs. These courses and projects will be supervised by Dr. Pascale Roy-Léveillée, a new Laurentian University faculty member specialized in permafrost science who was appointed as assistant professor of Geography in January 2015, was appointed as adjunct professor in Biology in April 2015, and became a member of the Laurentian University Cooperative Freshwater Ecology Unit in April 2016. Dr. Roy-Léveillée is an active member of the Canadian Metis Federation and is part of a diverse and dynamic group of indigenous faculty members at Laurentian University and the University of Sudbury.